Prow shaped balcony, pipe rails and stucco wave create a maritime feel for this aptly named “Boat House”. A built in breakfast table maximizes space, and increases maneuverability. 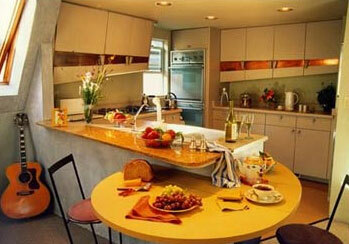 Laminate cabinets with copper trim blend with colored walls. And the spiral staircase leads it occupants upward into useful, colorful light-filled spaces.